The residential construction industry is starting to get out of concrete and sonotubes and getting into a newer, cheaper, and faster option. There is a growing trend to move away from the traditional process of installing a sonotube filled with concrete to provide a footing for decks, sheds, cottages or home additions. One alternative is a helical pier or screw pile which is an engineered metal post that has a helical blade welded to it that allows the post to be literally screwed into the ground. Pro Post Foundations helical piles are in conformity with the National Building Code and are certified by the Canadian Construction Materials Center under licence 13608-R. This licence confirms engineers, architects, cities, and municipalities that our piles are in conformity with the latest edition of the National Building code in all provinces of Canada. In this article, we present the main reasons why the industry now wants to go on a more efficient technology demonstrating all you need to think about when choosing to install a sonotube filled with concrete and then choosing helical piles. 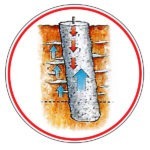 Sonotubes filled with concrete are and can be a solution as a foundation for your project. A problem remains however: Even though we can find information about bearing capacity of concrete, footing size and frost depth in the National Building code, it does not provide on how to dig a proper footing hole. That is where most of the problems begin. You must as well avoid all the pitfalls associated with digging the hole and mixing the concrete itself. 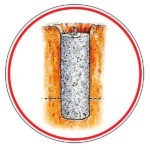 So many of us manage to install sonotubes ourselves or hire companies that are willing to install concrete posts at a real cheap price thus saving money but by doing so, the real question is: Is your investment/structure protected against heaving, cracking and is it solid? To save money, some installers will offer you to pour concrete directly in the hole. Concrete will cure in the shape of the hole therefore being uneven and providing grip to frost during the winter season. Not easy to dig a perfectly vertical hole. Concrete poured in an angled hole, will result in the load to be on the side rather than on the total concrete post. Moreover, the angled posts will allow frost to grab it and to move vertically during the heaving period. Unfortunately pouring concrete in a hole by an inexperienced crew can result in different shapes from one concrete post to another. As a consequence of this, you may experience sinking posts, lifting posts or even realize that the concrete post is broken. 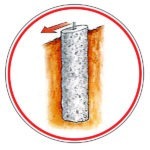 When no form is used to save money, debris such as rocks, roots and other material close to the concrete post, will impinge on the side of the concrete post therefore creating uneven sides which allows movement due to frost heave. Have you ever dug to the required frost line level? Depending on the means you have at your disposal, digging using a shovel is quite challenging. Installing foundation under frost line is very important to avoid any movement of the structure but the depth to which concrete is poured is often questionable. 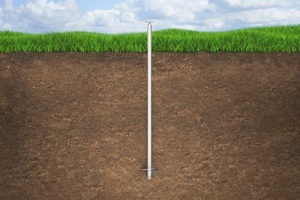 At this point in time, when digging four feet or deeper, we do not always have space, energy and time to make sure that the bottom of the hole is flat to reduce the probability of the concrete post to sink in the ground due to the base being pointed or round. For every foundation, you need a proper footing below the frost line. In order to get an adequate bell shaped (big foot) footing, a larger hole is required which means extra excavating and concrete. Not only do we have to dig deep enough to install the concrete sonotube below the frost line but we must ensure that it sits on a stable ground layer which is sometimes found deeper below frost level! To further add on concrete posts… now we need to properly prepare the mix. The next step into installing concrete sonotube is to prepare the perfect concrete mix to be poured into the hole we prepared. It sounds easy but adding too much water or too much concrete will suffice to affect the concrete post quality and bearing capacity. Not to be too dry! Not to be too wet! 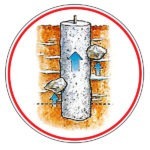 The pouring of concrete not to be interrupted to make sure there are no different aggregate or curing periods in the layers of the concrete post. Be rod or vibrated during pouring to ensure that layers are intermixed. We are not done yet! Still more setting mistakes to avoid. You did not pour enough concrete in the hole and as a result the top of the post is below grade? This is not recommended as the connectors as well as the base of the structure will be more at risk of corrosion and rotting due to the contact with surrounding dirt. Your structure is to be installed in a sloped area and now that the concrete is dry you realize that the top of the concrete posts are uneven and not levelled? Very hard to install a straight and solid structure on uneven posts you agree? While digging many of us may hit a shallow water table or a damp area. In order to provide for concrete resistance and not affect its quality, you need to isolate the water from concrete therefore adding time and extra costs to your project. Now that your lawn is damaged, and that you waited extra time for excavating, you still need time for concrete to cure which is, remember, weather dependent. Not to mention that you now need to find an area to dispose of the earth excavated or have it removed from the site. To consider endless trips to the hardware store for heavy bags of concrete and perhaps a concrete mixer rental, plus the back breaking task of excavating each hole and discarding the debris or the added expense of hiring a contractor to handle the sonotube process. How about the alternate, the helical pile installation? A reliable, cost efficient, time saving and engineered product. 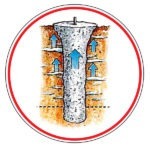 Pro Post Foundations screw piles in return, should be considered as your best alternative to concrete sonotubes. Installed using a mini Kubota tractor, our polyvalent equipment will not damage your lawn as it has turf tires and allows to extract obstacles from the ground when necessary. The construction of your structure can begin immediately after the screw piles for your project have been installed by your certified installer. 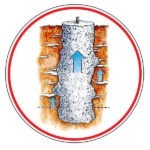 Pro Post Foundations certified installers have access to engineer services that will provide the necessary documents required by cities and municipalities such as engineer reports that illustrates the structure to be supported by screw piles and details of each Pro Post Foundations screw pile to be installed such as pipe diameter, blade size, depth and compressive bearing capacity thus ensuring quality of your foundation. 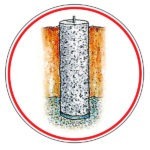 Through extensive engineer testing on the compressive bearing capacity, tensile and lateral capacities of our piles in different types of soils such as sand/silt and clay soils, Pro Post Foundations helical piles are certified in conformity with the National Building Code under CCMC licence 13608-R and have Minister’s Ruling in Ontario. Pro Post Foundations expert installers will at all time monitor the pile installation so that it is perfectly levelled not slanted. Pro Post Foundations screw piles are all about engineered product therefore your expert installer can provide engineered documentation on the product. All screw piles have the same shape, no need to worry about its components as Pro Post Foundations has quality control management on its product. Longer pile size and screw pile extensions are made available to allow installation to a stable layer ensuring quality of foundation. Environment friendly as they are reusable and do not contain phosphate like concrete does. 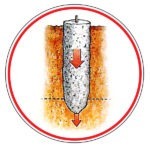 Pro Post Foundations piles are galvanized therefore resistant to corrosion. You will have seen for yourself, the criteria for a successful concrete sonotube installation are numerous. Messy and endless in comparison to the efficiency of screw piles. 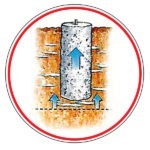 For a solid and long-lasting foundation, require the PRO, require Pro Post Foundations. 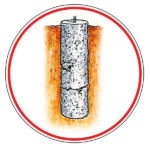 We welcome you to visit our website for a complete description and installation video on our helical piles.